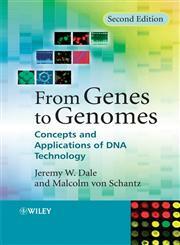 The Title "From Genes to Genomes Concepts and Applications of DNA Technology 2nd Edition" is written by Jeremy W. Dale. This book was published in the year 2007. The ISBN number 0470017341|9780470017340 is assigned to the Paperback version of this title. The book displayed here is a 2nd Edition edition. This book has total of pp. 400 (Pages). The publisher of this title is Wiley-Interscience. From Genes to Genomes Concepts and Applications of DNA Technology 2nd Edition is currently Available with us.